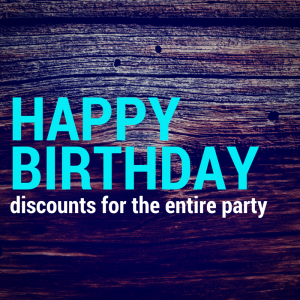 Enjoy this birthday discount on the day of your actual birthday! *Birthday Dinner Discount is a discount based on the number of guests in your party; for example 1-2 people dining receive a 50% discount, 3 people dining 33% discount, 4 people dining 25% discount, 5 people dining receive 20% discount, 6 – 9 people 15% and parties 10 and larger receive 10% discount. Offer only available on the day of your birthday with valid identification – driver’s license for adults and birth certificate or school id for children. Offer only extends to the food portion of your bill (tax, gratuity and alcohol are excluded). Discount limit is up to 50% off total food portion of bill. Not valid with any other promotion, offer or discount. Dine in only.